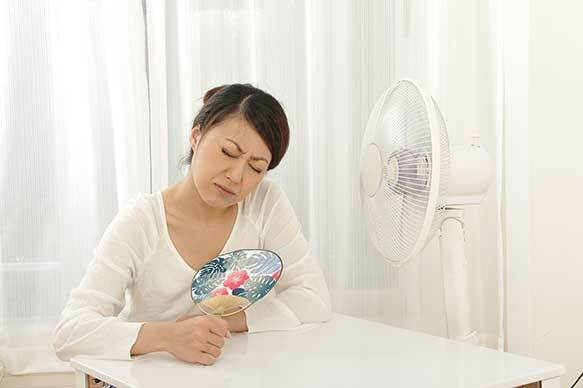 Hot flashes are sudden episodes of feeling abnormally hot, often accompanied by sweating and flushing of the skin. When hot flashes interrupt sleep, they are known as night sweats. Hot flashes and night sweats are the most common symptoms of menopause, and can occur regardless of your actual body temperature. Menopause is a milestone in a woman's life defined as when she has not had a menstrual period for one year. Menopause, and the few years leading up to menopause known as perimenopause, are characterized by a drastic drop in estrogen levels. It is this lack of estrogen that is responsible for hot flashes. This symptom can be experienced due to low estrogen caused by any number of medical conditions. However, the exact mechanism that causes hot flashes remains unclear. Researchers believe that low estrogen has an effect on the hypothalamus, a part of the brain responsible for temperature control. Hot flashes are not very well understood by medical science, but they are very common. Research shows that 97 percent of women will experience hot flashes due to menopause. This symptom can persist for a long time after menopause has passed; one study found that 33 percent of women still experience hot flashes from time to time even 10 years after menopause. Why Relieve Hot Flashes Naturally? One of the most common conventional ways to relieve hot flashes is through hormone replacement therapy. This involves taking prescription estrogen pills by mouth each day. Replacing missing estrogen can relieve hot flashes, but they often come with side effects. Many women who take estrogen pills experience a headache, stomach problems, weigh gain or breast tenderness, among many other ailments. However, estrogen replacement therapy can have other effects much more serious than these side effects. Taking such prescriptions may raise your risk of breast cancer, heart attack, stroke and blood clots. Hormone pills are also incompatible with many medical conditions, and if you have an ongoing medical condition your doctor may recommend against this method of treating hot flashes. Prescription estrogen should not be discounted entirely, as it is necessary to treat the most severe cases of hot flashes. Yet, it is not appropriate for everyone. Many women whose hot flashes are mild-to-moderate can find success using natural methods that have no side effects. Every woman's experience is different, so figure out for yourself whether there is a pattern of any of these things causing hot flashes. A few lifestyle adjustments can further reduce your chance of suffering a hot flash. Avoid alcohol and tobacco, even if it doesn't seem like such substances directly cause hot flashes. If you are overweight or obese, losing weight can help reduce hot flash severity. Keep cold water and fans at hand as often as possible to find relief when a hot flash does occur. If you don't have a regular exercise habit, now is the time to build one! Exercise is great for reducing the severity of menopause symptoms, and research suggests that menopause-aged women reap bigger benefits from the same amount of exercise than younger women would. Lastly, adjusting your diet could also help. Specifically, increase your intake of omega-3 fatty acids and phytoestrogens. Good sources of omega-3 fatty acids include flax seed and fatty fish, while some good examples of phytoestrogen sources would be soy, flax seed, sesame seed, whole grains, beans and legumes (phytoestrogens are compounds found in plants that act like estrogen in the body). The above lifestyle adjustments can be a big help. Combine such measures with scientifically proven menopause herbs for maximum results, free of side effects. One of the best natural supplements to take for hot flashes is maca (Latin name Lepidium meyenii). This is a root plant that grows in the highlands of the Andes in Peru. Related to radishes and turnips, maca has a wide variety of medicinal uses—not the least of which is that it relieves menopause symptoms. Maca can reduce hot flashes while also boosting your mood and energy and soothing anxiety. It is not known exactly how maca works to relieve hot flashes, as it does not effect estrogen levels or contain any phytoestrogens, but studies prove its effectiveness. Another great option is damiana leaf. This leaf is taken from a medicinal shrub native to Central and South America, Turnera diffusa. Damiana contains apigenin, a bioflavonoid known for its relaxing, anti-anxiety effects. Apigenin also acts a phytoestrogen, making it useful for treating menopause symptoms. Taking more than one herb for hot flashes will increase the results you see. Maca and damiana are a great combination; the two herbs will work in synergy to treat and prevent hot flashes. Other herbs to consider include dong quai, ginseng, licorice root, motherwort, red clover, sage and valerian.